Win a Personalised Kitten Soft Fleece Baby Blanket this July! This month you could win one of our Personalised Fleece Blankets. Handmade by Little Lucy Willow we think these blankets are a fantastic gift to a new baby. To win all you have to do is comment below who you would like to win one of these beautiful blankets for and why. The competition closes at midnight on 31st July. The winner will be announced on the 1st August 2018 through our facebook and twitter as we do not take email addresses. So it is up to you to keep checking. Good luck! Also check out our Tilly Fleur Nursery Collection. ..
What did we learn from Child Safety Week 2018? As parents, we are constantly looking out for danger and can usually spot an accident before it actually happens. Sometimes it may be too late but with plasters at the ready, we patch things up, wipe away the tears and get to work with our best distraction techniques. Occasionally however, child accidents are much more serious matters and require a trip to A&E. Child Safety Week, run by Child Accident Prevention Trust aims to highlight such dangers each year, through displays and activities in a fun and engaging way. This year, the campaign was held in early June with events all across .. When it comes to creating the perfect child’s bedroom, there’s no doubt many parents feel that girls are the easy ones to please. With just a few sparkles, fairy lights and fabulous fabrics, it is possible to transform a girl’s bedroom into a palace in no time at all. Boys’ bedrooms however, often seem a little trickier - but allow us to bust that myth once and for all! By choosing wisely and asking your child for their input, you can design a space that is fun, cosy and perfectly suited to their growing and changing personality. Furniture Where space is at a premium.. 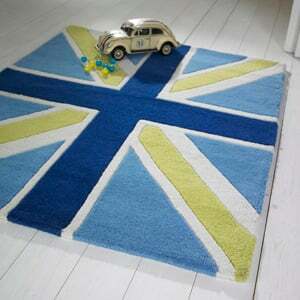 Win a blue Union Jack Rug worth £79 this June! As our last competition for this rug was so well recieved last time we are giving you another chance to win one of our Blue Union Jack Rugs! All you have to do is comment below with who the rug is for and why they deserve to win. We will announce the winner on our twitter and facebook at the end of June and will post it out straight away. So remember to follow and like us on our social media as we will not have contact details to get in touch with the winner. Good luck! ..
As the seasons change along with the weather, it’s always a good idea to make sure your child’s bedding is suitable for a comfortable night’s sleep. In winter, cosy duvets and quilted throws are the perfect way to get snuggled up at bedtime, but when summer comes around, it’s definitely time for a re-think! Aside from the heat, there are other considerations to take into account, not least allergies, which can often be at their worst during the summer months… Hypoallergenic children’s bedding If your child suffers from asthma or allergies, we have the ideal beddin..
With so many ideas available for girls’ bedroom design on television, in magazines and on social networking sites, you may find yourself overwhelmed with possibilities. But if you think of your daughter’s room as a blank canvas upon which their growing personality can be expressed through colour, fabric and style, it may help to narrow your options a little. Involving your child in the decision-making process can mean the project takes a little longer than intended but at least there will be no complaints upon the ‘big reveal’! We have put together a few ideas to get your designer.. 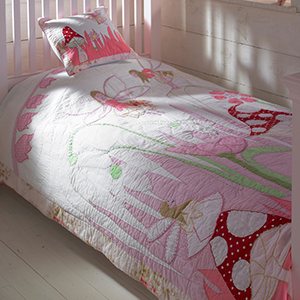 Win a Fairies in the Garden Children's Bedspread! Enter our competition and create a magical fairy wonderland for your childs imagination to run wild with one of our fairies in the garden bedspreads. To find out how to enter scroll down. It's easy! All you have to do is comment below who you would give this as a gift to and why. The winner will be announced on our social media at the begining of June, so add us on facebook and twitter. ..
Buying a child’s bed is one of the biggest purchases you are likely to make when furnishing your home, so it’s advisable to knuckle down and do your homework before taking the plunge. Think long term, rather than just a few years ahead. Try to find something that will complement your child’s ever-changing tastes as they grow. You need a stunning, timeless, dependable piece of furniture that will still look and feel fresh decades from now. 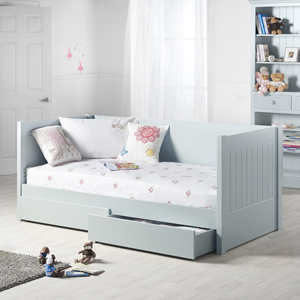 Style It’s important that your child really does love their bed, so finding something that looks great is almost as essent..
Beautiful children’s storage for beautiful tidy bedrooms! Nowhere in the home is great storage more essential than in a child’s bedroom. Between the countless cuddly toys and train tracks, there are Barbie’s miniscule earrings and stray Lego blocks to contend with. Just don’t venture into the vortex with bare feet…Ouch! To combat such never-ending piles of paraphernalia, it could be time to invest in some savvy storage solutions. At Little Lucy Willow, we know exactly what you need to make sure all those bits and bobs have a designated place at the end of each busy day’s playing… Storage bags – Stylish and flexibl.. 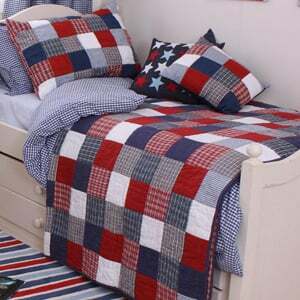 Win a boys McKenzie bedspread and matching pillowsham! So easter is over and you have done the spring cleaning. What better way to spruce up your little boys bedroom than with a McKenzie bedspread and matching pillowsham! To find out how to enter scroll down. It's easy! All you have to do is comment below who you would give this as a gift to and why. The winner will be announced on our social media at the begining of June, so add us on facebook and twitter. ..
Moving your child from a cot to a bed can be a very tricky time - not least for mums and dads. What if your child won’t sleep? What if they keep getting up? Worse still, what if they want to sleep in your bed every single night?! Whatever your worries might be, try and leave them at the bedroom door. If your child picks up on any jitters or nerves about the impending ‘big move’, it could scupper your plans for a smooth and easy transition. At what age should I move my child from a cot to a bed? Every child is unique, so the answer to this will vary greatly. The.. Decorating the nursery is a very exciting time for new mums. Creating a comfortable and safe space for baby is always top priority - but delightful décor comes a very close second! For most mums this means getting completely carried away with every teddy bear, bell and whistle imaginable. As lovely as that is, it also helps to leave space in those plans to consider the world of toddlerhood too, so there won’t be a vast amount to change when the time comes. The early months of motherhood are often a blur of feeding, soothing and snatched hours of sleep. But before you know it, y.. 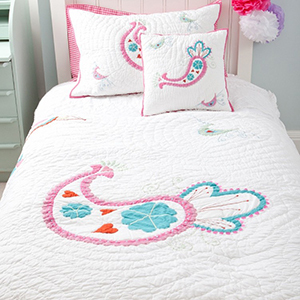 Win a girls paisley bedspread and matching cushion cover! For the month of March we have an exciting competition for you. As it is nearly spring, we thought we would treat you to a girls paisley bedspread and matching cushion cover to spruce up your child's bedroom. To find out how to enter scroll down. It's easy! All you have to do is comment below who you would give this as a gift to and why. The winner will be announced on our social media at the begining of April, so add us on facebook and twitter. .. If your child’s bedroom is a little on the small side it’s probably going to need the most work. Aside from choosing the right bed, furniture and décor to suit a small room, children tend to have a mountain of paraphernalia which they seldom want to part with! With this in mind it pays to make sure you maximise every inch of their available space. We’ve put together a few ideas to help you get those little rooms just right and create a stunning space that your child will love to call their very own. Mirror mirror on the wall… Natural light can make or break a r..